What Exercises Are Good To Prevent And Treat Knee Osteoarthritis? Home Health And Wellnes Is Exercise Good For Knee Arthritis? Is Exercise Good For Knee Arthritis? Physically active individuals are healthier, happier and live longer than those who are inactive and unfit. This is especially true for people with arthritis. How exercise helped a senior regain his mobility and continue his gym workouts – A Living Example! In my block lives a retired army captain. We used to meet often in a park in our neighborhood. All of a sudden, he stopped coming to the park. Can Exercise Help Ease Your Knee Osteoarthritis? Few days later I saw him in evening at the milk booth. I was curious about his well being, so asked why he was not coming to the park in mornings. He told me that when he wakes up in morning he feels “pains and twinges” in his knees. So, he has visited his doctor for a checkup, the doctor has diagnosed: “osteoarthritis of the knees”. Fortunately, I had a friend at the University in our neighborhood. The researchers there were testing exercise regimens for people with the similar condition through which he was going through. I asked him to go there. Next day he visited the university and signed on. He was enrolled for a supervised aerobic-exercise program 3 times a week and then added strength training. Years ago, he might have been advised to sit back, relax, and take it easy and cautioned that exercise could put too much strain on his damaged knees. But recently, a body of study findings has found that exercise is one of the best things you can do to alleviate the pain and functional limitations of knee and hip arthritis. Exercise can help keep knees limber and builds strength around knee joints. Exercises combined with strength training can help you take control of your knee osteoarthritis. 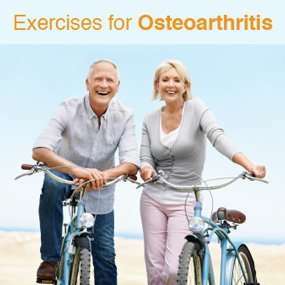 Exercises can make arthritis sufferers’ pain levels go down and also improve remarkably their functional movements in activities like climbing stairs, getting in and out of chairs, and walking speed. However, a bit of precaution is necessary. People who are suffering from arthritis need to avoid joint injuries. That means no contact sports or strenuous activities with a high potential for impact on the joints, such as skiing. But walking, biking, and low-impact aerobics combined with strength training have been extensively studied, which have clearly shown extremely good results for people with arthritis. He is totally convinced on exercise, so am I! Suggested Exercise: For the people with knee osteoarthritis, exercises that involve deep knee bending aren’t a good idea. Instead, start with a modified squat and go down as far as you can without much pain. Best way is to stand in front of a straight-backed chair and slowly squat as if you’re going to sit in it. While you squat, your knees should remain over your ankles – don’t allow them move forward past your ankles. Stop if you feel any pain. Depending on your level of fitness, you can initially do 5 semi-squats 3-4 times a week, and then move up to 10. Related Link: Fitness For Seniors. I was diagnosed in June, 2013 with OSTEOARTHRITIS of the spine and both knees, symptoms started with severe back pain, joint swelling and stiffness in my knees and eventually the feeling spread to my shoulders and neck, i couldn’t lift my arm without pain medications. I was prescribed tramacet and arcoxia for 8 months but had to stop them due to bad effects. In 2017, I started on OSTEOARTHRITIS HERBAL FORMULA from RICH HERBS FOUNDATION, this natural herbal treatment reversed my osteoarthritis.